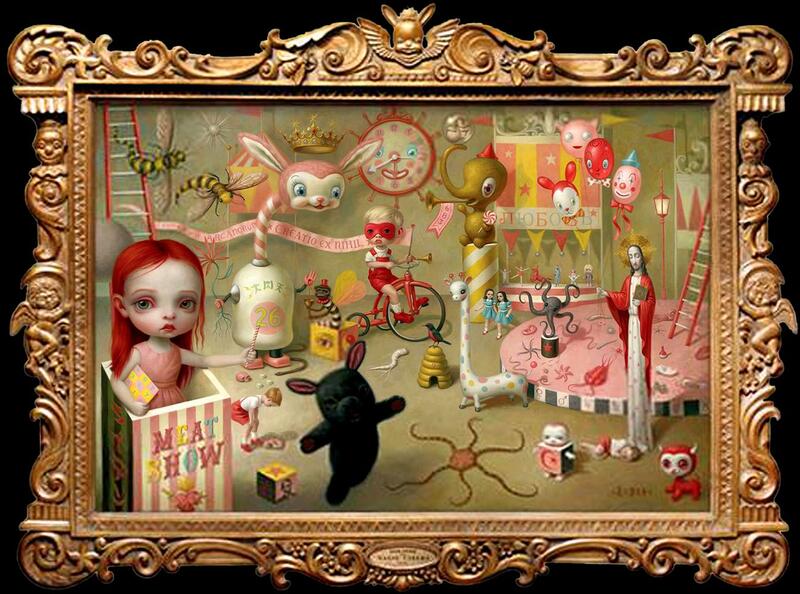 The Magic Circus is a bizarre contemporary gothic painting created in 2001 by Mark Ryden, the king of the pop surrealist painters. Ryden was born in the Pacific Northwest and grew up in Southern California. At the beginning of his career, he was a commercial artist who created magazine illustrations, book covers, and album covers, but due to the outlandish visionary intensity of his work, he has successfully broken into the rarified top echelon of contemporary painters. His works have sold very successfully for over a decade (although he is regarded as a bizarre outsider by the unofficial “academy” of curators and critics). The Magic Circus is an eye popping juxtaposition of cartoonlike hybrid animal/toy characters, science book illustrations, and delicate vulnerable children. The upbeat but sinister pastel circus landscape has been rendered with the precise and exacting realism of the finest illustration. As with 16th century Flemish art, dark horrors lurk among the details. Looking past the dazzling crown and jewel-like bees and cheery dancing octopus, the viewer notices a striped winged demon with a shrunken head drinking a chalice of blood. Jesus and Abraham Lincoln are rendered as toys and lifeless sculptures while a plush stuffed animal capers in the foreground with lively malice. Many of Ryden’s works involve the idea that our icons and consumer goods are springing to malevolent life and taking over. The Magic Circus has the visceral appeal of a child’s nightmare. The toys are coming to life and putting on a show, but there is a dark and horrible side to the carnival. 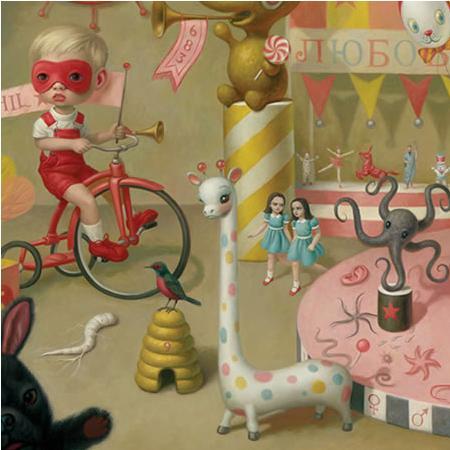 Within the interlocking “rings” of childlike delight, scientific materialism, and commercial exploitation, Ryden includes symbols and themes which he reuses again and again in his paintings.